Are you struggling to achieve your IELTS goals in the Speaking component of the IELTS exam? Are you frustrated with taking the exam again and again and again but without any improvement in your Speaking score? Are you tired of learning long lists of vocabulary, revising the same old grammar points and staying up late to fit in more study sessions? Are you running out of time to get the score you need? Do you need Band 8.0 or higher in the IELTS Speaking test in 2019? Model answers to IELTS Speaking questions appear throughout the course. This book outlines everything you need to know about the IELTS Speaking Exam. It will help you if you have never taken the IELTS Exam before, or if you have already taken the exam and want to receive a better speaking band score. This book is a great way to help you successfully increase your IETLS Speaking score. It will help you develop the skills needed for the IELTS Speaking exam. This book is designed to help you score an 8.0+ band score on the speaking section of the IELTS exam. This book is dedicated to more than just the IELTS speaking exam. I focus on tricks and tips to help you pass the exam, but more importantly, I give you tips that will help you become more fluent in your everyday life! This book can be valuable to you in your English learning because it will teach you useful expressions to talk about a variety of topics, as well as show you tricks and details that make native speakers sound... native. It is my personal mission to make you sound more fluent by the end of this course. Thank you so much for taking the time to check out my book. I know you're going to absolutely love it, and I can't wait to share my knowledge and experience with you on the inside! Don’t delay any more seconds, scroll back up, click the "BUY NOW WITH 1-CLICK" button NOW and start mastering IELTS SPEAKING TODAY! IELTS SPEAKING PART 2 ANSWERS 2019: Top 121 Ielts Speaking Part 2 Model Answers For An 8.0+ Band Score! Mediterranean Diet Meal Plan: The Beginners Complete Guide with Meal Prep for Weight Loss Solution, Gain Energy and Fat Burn with Recipes. Cookbook Secrets for Health Watchers. I have used some of the ideas from this book to write some really interesting speeches. This book is also written in a way that would allow it to be a useful tool for teaching a class on speech writing. I am struggling to achieve my IELTS goals in the Spealing component of the IELTS exam. And this guide was recommended me by my friend. This book includes lots of speaking samples, vocabulary, collocations and idioms to increase my score to 8.0+. I found this book very informative and helpful. It is well written and easy to understand. This book has really everything I need to know about the IELTS speaking exam. I liked this book very much and I want to thank the author for such useful guide. Highly recommended. 5.0 out of 5 starsHelpful read..! This book helps with good strategies that can be adopted in clearing your IELTS. This is a very good comprehensive study guide specifically aimed at preparing for the IELTS SPEAKING STRATEGIES 2019 proficiency exam. There are also practice questions so you can have an idea of how the real test looks like. I recommend this book to anyone preparing for this test. I recommend this book to anyone preparing for this test. 5.0 out of 5 starsEducative book. This is a great Ielts book when talking about the section of Speaking. 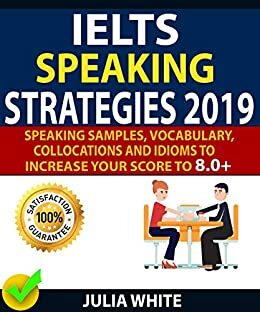 This book covers all tips, samples answers, expalinations, idioms and other helpful things that Ielts takers need to know to get high scores in the exam. I love all information, tips and guides inside the book. Very informative and helpful. This book is a must have for students. This book is a great resource for all students who want to improve their speaking band sore in the Ielts exam. All of the tips, samples, vocabulary and guides inside the book are well designed and illustrated for each part of the speaking section. Overall, this book is a must read for all students when it comes to the topic of Ielts speaking.